This mini-book is quite simple with images that should appeal to young children and simple words that children in PreK thru Kindergarten should be able to read themselves (in context with the pictures). Feel free to make as many copies as you need (just don't sell them as they're meant to be free for all to use.). Use our Autumn Activities to complement the mini book. We have prepared a demonstration video about assembling your mini book. Watch it here. Print template of choice. The B&W version is fun for young children to color in or for older children to color as gifts for younger ones. I like printing a color cover and B&W pages. Color the template pieces if you are doing the B&W version. If you imagine a 'real' book for a second, you know that each page has printing on the front and the back. We're going to fold the pages to make it like a real book. Ignore the cover for now. Fold each page along the center dotted line so the images are on the OUTSIDE and the blank sides of the paper are on the inside (imagine you're making a greeting card). Stack the pages, so the odd numbers are on top and the folded edges are lined up. Trim with scissors or paper cutter if needed. Fold the cover page along the dotted line, again with the images on the outside. OPTIONAL: You can laminate the cover page or print it on cardstock if you want it to be more like a real book's cover. Open the cover page (like a folder) and slip the pages inside so that when you open the cover you'll see page 1 -- the unfolded edges of the pages will go against the folded part of the cover. Close the cover page and tap the book so everything lines up. Put three or four staples along the edge to hold the book together. 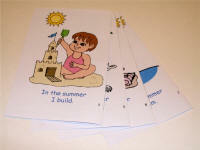 Flip through the book once, carefully folding the pages to make the book easier for the children to read. There'll be less trimming to do if you also turn off the headers and footers. Pg 1 Mom! The wind is cool. Pg 2 Mom! I need a sweater. Pg 3 Mom! The trees are orange. Pg 4 Mom! The pumpkins are ripe. Pg 5 Mom! The squirrels are busy. Pg 6 Mom! The birds are leaving. Pg 7 Mom! The kids are playing. Pg 8 Dear one, it is autumn!